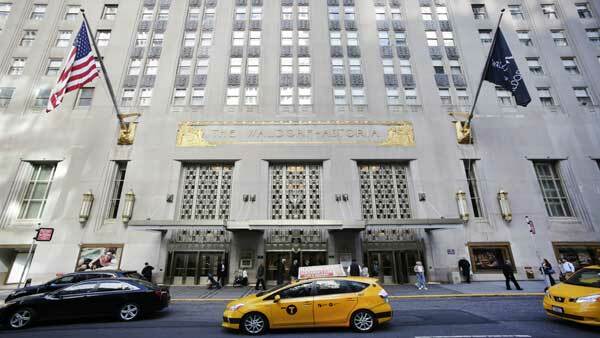 NEW YORK -- The word "grand" matched few hotels in the world better than New York City's Waldorf Astoria, but this bastion of gilded splendor is now closing for two to three years for a transformative makeover. The last guests were checking out by noon Wednesday after enjoying the rich Art Deco style of the old Waldorf one last time. When the building reopens, it will still have a hotel, but hundreds of its 1,400 guest rooms will have been converted into privately owned condominiums, according to a spokesman for the Anbang Insurance Group, the Chinese company that bought the storied hotel for nearly $2 billion in 2015. "I've been watching New York disappear in front of my eyes," lamented Shade Rupe, 48, an author and actor who visited the hotel's lobby this week for one last look around. "There's so little of what we've known as iconic New York left, and as soon as you say the Waldorf Astoria, that's like saying the Empire State Building or the Statue of Liberty. It's huge!" The Waldorf Astoria's history dates to 1893, but its original home was torn down to make way for the Empire State Building. The "new" Waldorf Astoria's more than 40 stories opened on Park Avenue in 1931, built at a cost topping $40 million ($639 million in today's dollars) making it one of the world's largest and most expensive hotels at the time. It has welcomed well-heeled guests including every American president - in the Presidential Suite, of course, behind bulletproof glass windows. The hotel also lent its name to the Waldorf salad, a mix of dressed apples, celery, grapes and walnuts that's become an American standard. Plans for the renovation are still not finalized, but some in the hotel industry said the new Waldorf will mirror the concept of New York's Plaza hotel, which was renovated a decade ago into a mix of private apartments and a smaller hotel. Anbang bought the Waldorf in 2015 from Hilton Worldwide Holdings Inc., which continues to operate it. "This can be a great real estate transaction, if they can get enough money selling the condominium units to cover the purchase price," said Bjorn Hanson, professor of hospitality and tourism management at New York University. Two hotel regulars, Rebecca Ward, 50, and her fiance, Martin Murphy, 51, of Orlando, Florida, returned for two days before the closure to celebrate their engagement. Murphy proposed to Ward in front of the hotel's giant lobby clock a month earlier. "We wanted to stay here for the last night of the Waldorf," said Murphy. As renovation work starts, the city's Landmarks Preservation Commission must vote on whether to officially preserve certain interior details of the building including the "wheel of life" created from 140,000 marble tiles above the Park Avenue entrance, the grand ballroom and the Art Deco lobby with its huge, chiseled tower supporting a diminutive Statue of Liberty. The exterior already is landmarked. As for the upcoming changes under Chinese ownership, Ward said, "I'm very sad. I think this is an American institution and I think it should stay American." But the couple said the modernization won't keep them from returning to the Waldorf when it reopens. At exactly noon Wednesday, dozens of hotel staff and guests spontaneously gathered around the lobby clock that served as a meeting place, cheering and clapping their farewell to the hotel that for 85 years symbolized money and power. Nearby, workers removed treasures from a jewelry shop where a sign read: "Out of business."